With Christmas on its way, getting friends together to craft ornaments is such a fun way to share in the holiday spirit! After I hosted a craft party this summer, it was so fun that we all wanted to do it again for the holidays. With ornaments as our crafts, the possibilities are endless! Ornaments are so simple too, and everyone can put their own touches on them. So here’s how I set up the party, to make it easier for you to host your own! 1. First, check with your friends to see if they are in for an ornament crafting event and pick a date. Sunday afternoons work well for us, so I asked for them to let me know if there were any Sunday afternoons during the month that they wouldn’t be able to make. 2. Shop your local craft stores to see what inspires you. Make your purchases during a sale! The cost ended up being $15 per person, and we were able to do as many as 5 different ornaments! I purchased enough ornaments for those that RSVP’d along with general supplies to be able to decorate them with. You may also want to purchase an extra of each to make example ornaments ahead of time. See below for pictures and the list of supplies that I purchased. Tip: Selecting ornaments that can be decorated with paint, ribbon, and add-ons like buttons or beads can allow for many unique creations! 3. Set everything up a day or two ahead of time. Instead of having different tables set up like the summer craft party, I chose to have a main crafting table that I covered with brown craft paper. This worked out really well, and it was the perfect arrangement to be able to connect and chat around the table. 4. 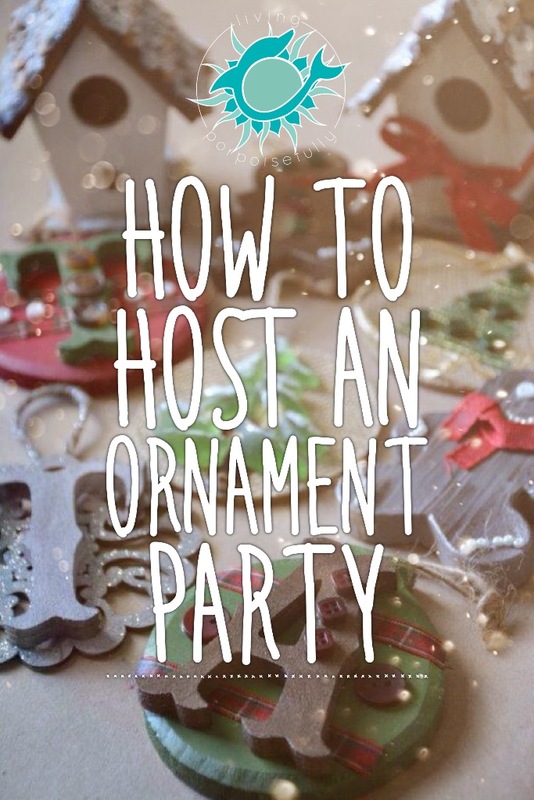 Have a few examples of ornaments, whether it’s making a few extra ahead of time, searching for pictures, or just talking about ideas with your guests. I decided to make the birdhouse with pine cone shingles, the gingerbread man, and the wooden letter ornament ahead of time to have as ideas. I also arranged buttons in different shapes (snowman, Santa hat, and a Christmas tree) on the burlap ornaments without gluing them down just to give ideas. You could also search for ideas online beforehand and have some photos available for everyone to look at. It was fun to see how each person made their own tweaks, or came up with their own ideas! 5. Keep food simple. To kick off our gathering, we drank spiced cider kept warm by the slow cooker, ate some munchies, and got to enjoy each other’s conversation. Connecting with friends is truly at the heart of this event! Once we had our fill of munchies, we all chose an ornament to start out with and it was off to the races. Time flew and so did creativity! For the guests to be able to easily transport the ornaments home, I jazzed up an ordinary paper bag with a stamped Christmas tree (brushed the stamp with red paint), along with some tissue paper to keep the ornaments safe while traveling. So easy! It was such a fun way to celebrate the holidays! The joy will last into the season, with being able to hang the handmade ornaments in a prominent place on the tree, or giving them proudly as gifts. I hope this post inspires you to enjoy the holidays with friends and loved ones in a joyful, creative way. Keep it simple, and live porpoisefully!